Brooklime, Veronica beccabunga, is an unassuming leafy green plant of damp freshwater places. The name may be unfamiliar but the plant is relatively common. 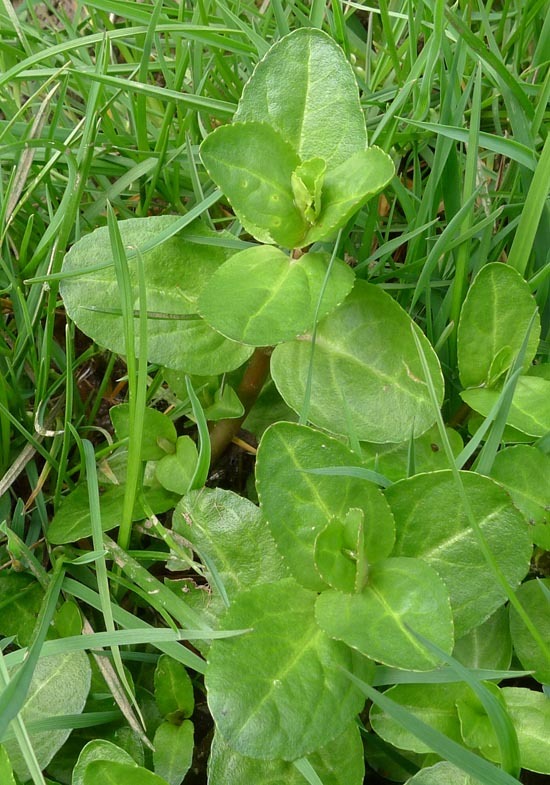 You’ll find brooklime growing in boggy ground (the sort in which you’d wished you’d worn boots, not shoes), on the damp margins of ponds, streams and rivers and sometimes within shallow streams. Typical habitat of Brooklime, Veronica beccabunga. Note the dampness of the ground. Photo: Paul Kirtley. The plant is hairless and has fleshy, succulent-looking green leaves that are oval, slightly serrated and arranged in opposite pairs on short stems from a round (not square) stem. The plant puts up shoots up to 30cm (12in) tall but often less than that. Brooklime has a tendency to sprawl with shoots trailing along the ground and where it does, the leaf nodes produce roots. It is related to speedwells and produces similar pretty little blue four-petalled flowers. There are no flower pics in this blog I’m afraid as it’s too early in the year (flowers May to September). 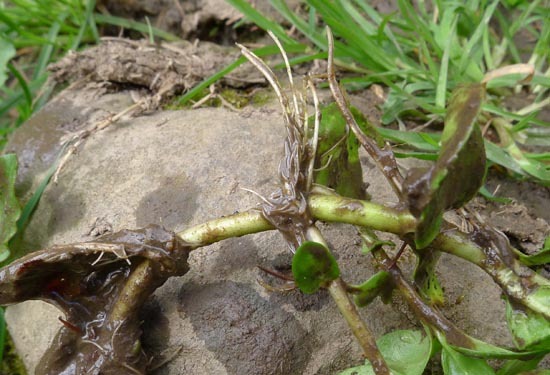 Part of a plant has been removed from the soft, damp ground it was trailing along. You can clearly see the roots growing from the leaf node. Photo: Paul Kirtley. You can eat the leaves and stem. 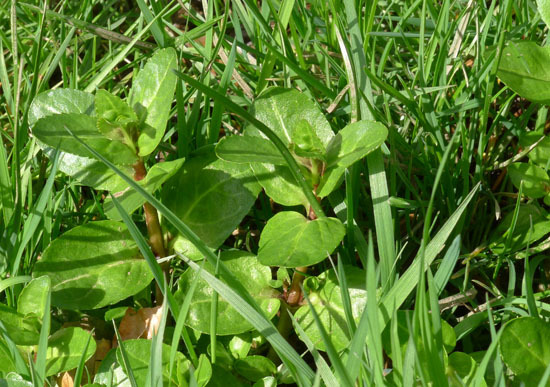 Miles Irving describes brooklime as “bitter without any redeeming features”. The leaves certainly look more succulent and tasty than they actually are but I think he’s being a little harsh. I guess it does depend on context though. I was first introduced to brooklime by Professor Gordon Hillman in 2002 while I was undertaking a bushcraft course that required us to live from the land for several days. On one of these days we’d spent most of the day building a shelter and hadn’t foraged very far, but we had found a few wild foods, including the newly-learnt brooklime. My group’s main meal was a small ‘stew’ consisting largely of water but also containing some chanterelles (oh what we’d have given for some butter to fry them in! ), opposite-leaved golden saxifrage and brooklime. It wasn’t the greatest dish we’d ever eaten. To begin with we’d roasted some crushed sedge seeds in the dry bottom of the cooking pot to add some extra nutrition before adding the water. We’d overdone the roasting and the seeds were somewhat charred, ultimately giving the whole stew a charcoal taste. The brooklime leaves were a welcome injection of freshness to our burnt-toast flavoured slop! On balance I’d say, for most people, raw brooklime is a little too bitter to be eaten in any great quantity. You could put a small proportion in a salad with other greens and it would be OK. Brooklime is easy to spot and collect, however, so shouldn’t be overlooked. It’s better added to soups or in the later stages of a stew to add some herbage. some more good information paul, again this is a plant that i havnt foraged for or eaten yet.When im out over the next few days il be sure to keep my eyes open for it and il let you know what i think of the taste. I have picked only one use, some of the other uses are a bit far fetched for this day and age. I have to say that for the last couple of hours I have been hooked by the amazing articles on this website. Keep up the wonderful work. The website is where it was identified: a great resource. Here, brooklime grows well in old red sandstone earth, across the crystal-clear stream. A neighbour relates that his Mother collected it to eat, perhaps 50 years ago so it has been growing here for a long time. I have not tried it yet. 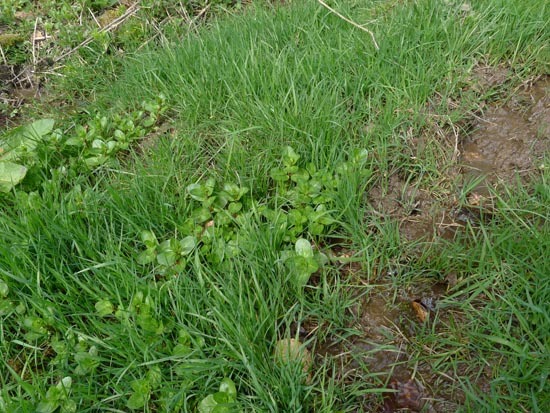 When I do, I shall ensure that I only use it in soups to ensure that any Fasciola hepatica flukes (liver fluke) larvae are killed – always an issue where there are animals on pasture drained by streams where this plant grows. This advice also applies to watercress in open countryside. Welcome and thanks for your comment. I’m glad you have found this site a useful resource. Thanks also relating that it was eaten in your area. >Do you have any veronica beccabunga brooklime I could buy from you or know where I could buy some from ? Do you want to plant it or just eat some? Roots or leaves or both? I can put some in a plastic bag and post it to you, if that would be helpful. email me your postal address and if it is in the UK, I will put some roots with leaves in the post for you to plant out in a wet spot. I am not allowed to send plants to you from outside the US. This is to prevent the transfer of unwanted organisms into the US. I’ve seen this exchange of messages and I just wanted to say thanks for your being so generous in offering to help out another reader of this blog. Agreed about the regulation, however. I would like to plant some Veronica beccabunga in Portugal. Do you know where I can obtain ( buy) it, please? Christopher Spry, can you send me please, some roots with leaves in the post for me to plant,? Ivo, in reply to the comment about its medicinal use – there is indeed a remedy for scurvy involving it. Dr John Ward’s diaries mention it (volume 15 p168) as ‘becabung.’ If you go to the Folger Library online and search the Luna catalogue you will be able to find the remedy – it is in Latin, and it dates to the second half of the 17th century, and involves a other things including Rhenish wine, etc. Also, Rhenish wine was to be found in certain wine-houses in London run by the Dutch, according to Pepys’s Diaries.